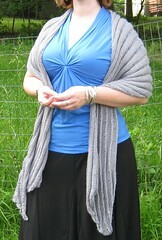 I finally finished Chicabean’s Clapotis, she asked for one after seeing mine last year. She wanted something neutral that she can wear over dresses so I chose grey. 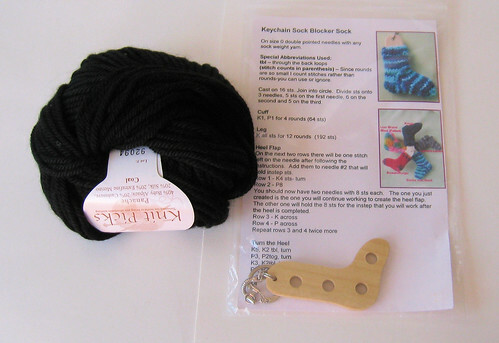 I used KnitPicks Elegance (alpaca and silk) so it would be a bit finer and thiner. 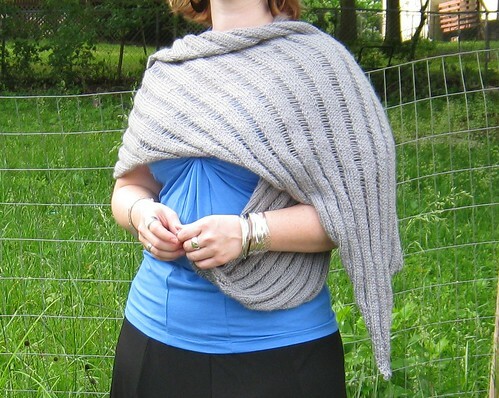 It has all the elegance and grace that is Clapotis. 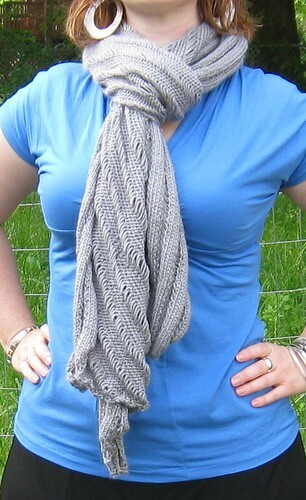 It looks great, it’s warm and soft and I think it’s the perfect length and width for what she wants to use it for. I hope she thinks so too. I sent it off to her on Monday. Perfect timing since her birthday is this week. Happy Birthday Chicabean! She turns 30! What can I say about Clapotis that hasn’t already been said? I’m pretty sure this wont be my last Clapotis! Wow! It’s been a crazy couple of weeks, whatever “it” is, I knew I’d lost “it” when I spelled my name wrong over the phone and gave someone a phone number that I haven’t had for years! 🙂 Luckily things are getting better. Just waiting on the appraisal for the house then we close on the 29th. I’m looking at 2 more apartments tomorrow then I’ll pick one. So packing and moving, but that’s not too bad. This weekend I created an etsy store for the wine charms, I thought more people would see them that way. Hurray! I’ll be so glad when they are all gone! I’m still knitting away on the Central Park Non Hoodie and I’m almost done with the front halves, then on to the sleeves! Hopefully I’ll get lots done this weekend! 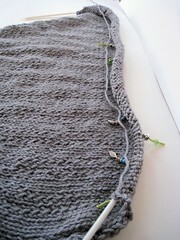 Clapotis 2.1 is progressing nicely. 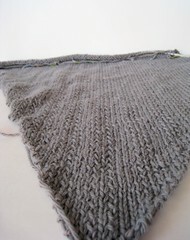 I’m using KnitPicks Elegance and it’s so soft! It will be a beautiful wrap when it’s done!